Although I’ve never heard anyone declare doing chores as their utmost favorite activity, most of us like to at least keep a tidy home. Depending on your personality, household chores can either be an extreme nuisance or a therapeutic activity. No matter where you’re at, it turns out doing certain household chores can damage your lungs. In recent years, more “eco-friendly” cleaning products have begun to emerge on store shelves. These new products claim to be environmentally friendly with biodegradable ingredients that will make Earth a cleaner place to live. But are these eco-friendly products enough to reverse the damage done by traditional household chores and products? According to researchers at Norway’s University of Bergen, studies have found that regular exposure to cleaning products, whether at home or on the job, has a significant impact on women’s lungs. While doing chores, irritation from harmful chemicals, such as ammonia, can occur and create major damage to the mucous membranes lining your airways. Household products, particularly those that aren’t labeled as “allergy friendly,” contain chemicals called VOCs (volatile organic compounds). These chemicals consist of sketchy additives like ammonia, benzene and formaldehyde (yes, some of the same products used to embalm deceased bodies!). The scariest thing about these products is the fact that these chemicals that most of us can’t even pronounce evaporate into the air when we use them, even while they are in storage! Keep in mind most household toxins are generally invisible. You may be asking, “If household chores are so deadly, how am I supposed to clean my home and workspace?” Well, creating your own natural cleaning products at home will put your health back on track. Check out these three household chores that you need to start avoiding ASAP — number three will shock you! Sweeping may seem like an innocuous chore. However, imagine this: every time you sweep, you’re causing debris from the floor to rise into the air. Then, with each inhale, you’re breathing the particles into your body. After regularly performing household and work chores, women seem to experience a greater decline in lung function over time than women who do not clean. Scientific studies also indicate an increased risk of asthma and respiratory problems among professional cleaners and people who clean regularly. This is particularly startling evidence for women who work as cleaners or regularly use cleaning sprays or other cleaning products at home. Instead of sweeping with a broom, use a Swiffer. It’s an alternative way to collect and get rid of dust off the floor without sweeping it into the atmosphere. To maximize the avoidance of chemicals, use this homemade floor cleaner made from all-natural household ingredients with the Swiffer instead of store bought sprays. No time to make your own floor cleaner? No worries, simply mixing 2/3 cup of white vinegar in a gallon of warm water will clean hardwood floors very quickly and easily while keeping your lungs in great shape! Vinegar has been used to naturally clean and disinfect surfaces for centuries. It’s a cheap and effective product that can be found just about anywhere. Vinegar isn’t just used for removing bacteria from surfaces, it’s also used for other household purposes, like as a natural fabric softener, a degreaser for dishes, and a cleaning fluid for windows and screens. Check out the 18 different ways to clean your home using white vinegar here. Using commercial cleaners may get your household surfaces to sparkle and shine but they will cause damage to your body in the long run. The release of chemicals in the air is directly inhaled by you and your pets. Furthermore, residue from dangerous cleaning sprays can linger in your home on surfaces for your body to potentially ingest. In fact, the effect of inhaling cleaning products is “comparable to smoking somewhat less than 20 pack-years” (a pack-year is defined as 20 cigarettes smoked daily for one year). Instead of spraying household surface like tubs and sinks with chemical-ridden products, use this Rosemary Lemon All-Purpose Cleaning Spray. Are you hooked on processed cleaning products because of their odor eliminating abilities? Ditch the chemicals and eliminate pesky household odors with this All-Purpose Fresh Sage Cleaning Spray. This spray is very simple and inexpensive to create. Using it will give you peace of mind while knowing you aren’t polluting your home. Lemon is a very effective cleaning agent. The acid in lemons is antibacterial and antiseptic, and it acts as a natural bleach. The best part is the citrus smell of lemons can create a refreshing and invigorating atmosphere in your home. Every part of the lemon is helpful to use — even the rinds can be used to clean and shine! Lemons and rosemary can also be made into oils for additional antibacterial effects. By the year 2030, chronic obstructive pulmonary disease (COPD) could be the third leading cause of death, according to the World Health Organization. Scientists predict that a major potential cause of an increase in COPD will derive from household air pollution from cooking and heating foods using biomass fuels. Completing cooking chores frequently in your home can put you at risk for developing COPD. Heating methods using solid fuels, such as wood and coal, are particularly dangerous. During a study, it was discovered that people who are exposed to household air pollution (HAP) from cooking are 41 percent more likely to develop COPD than those who aren’t exposed to HAP. Since cooking frequently in your home creates household air pollution, try using meal prep to avoid using cooking devices every day. You can designate one or two days a week to prepare your meals for the week all at once instead of cooking multiple times a week. This will significantly decrease your chances of developing chronic obstructive pulmonary disease and other respiratory issues. Cleaning might not always be the most entertaining activity on a to-do list but it’s necessary for keeping areas neat and tidy. Understanding the cons of popular cleaning products is crucial for your health. Using products with harmful chemicals will decrease the health of your lungs over time. To avoid destroying your lungs, create your own cleaning products using natural ingredients, properly ventilate your home and workspace, and never use processed sprays. For even more environmentally friendly cleaning tips, check out Alternative Daily’s five green home solutions. What’s your favorite all-natural cleaning method? Leave your comments below! 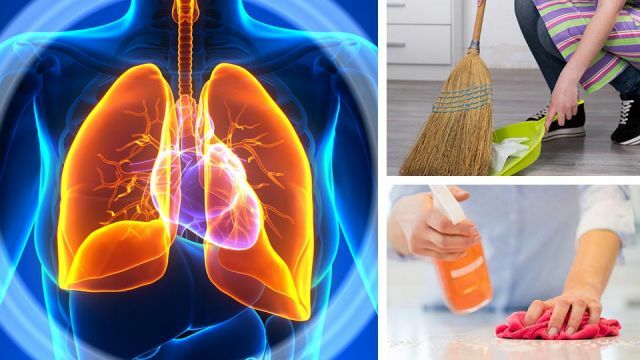 Hey Buddy!, I found this information for you: "Beware: These 3 Household Chores Are Damaging Your Lungs". Here is the website link: https://www.thealternativedaily.com/these-3-household-chores-are-damaging-your-lungs/. Thank you.